The hour is nearing midnight. I have a ton of art history to prepare for tomorrow’s classes. But I cannot avoid posting this completed oil painting from my private student. Out of respect for her privacy, I have refrained from posting her identity, her school, her city, etc. And in that way, I feel that I have withheld giving her her due. But you understand. What I must say, however, is that I have never in a quarter-century of instruction encountered a ninth grade student with this level of skill and confidence. I’m thrilled to watch someone pursue the bliss of painting the way she does, and I’m also grateful to see such supportive and proud parents who watch her development with enthusiasm. 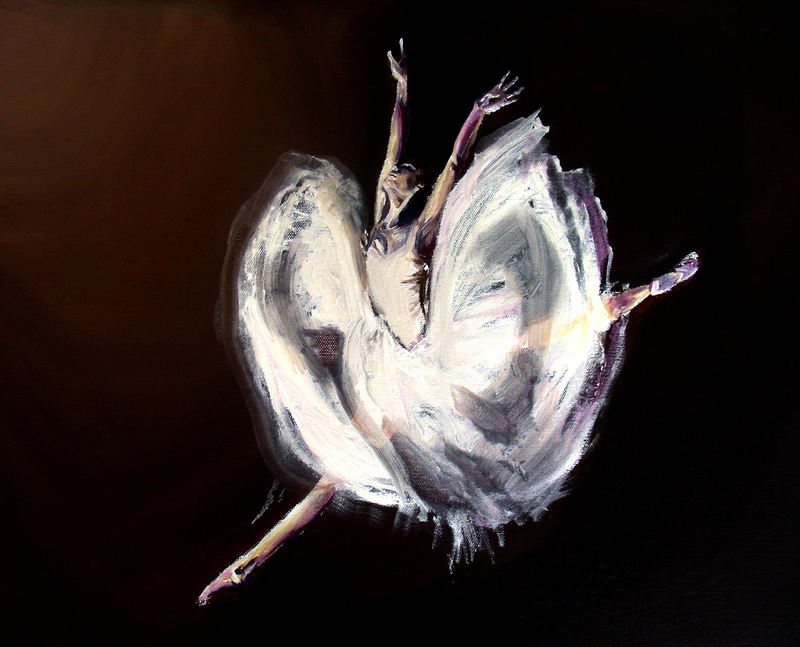 My student worked diligently this evening, refining the tutu and reworking the background as she saw necessary. I thought the painting looked good as it was left Saturday afternoon, but tonight’s finishing touches certainly lifted the entire work to a new level of excellence. Tomorrow she starts on another adventure, and I look forward to seeing what kind of painting emerges from her brush next. I regret that these posts of this flatiron are not changing more profoundly, but frankly, I’m up to my elbows drawing and re-drawing details on this building! The 22 x 28″ paper is daunting in size, and I keep getting lost as I devote long periods of time developing an area that is only a few square inches at a time. The school schedule this week is promising to be more “intense” than usual, with my three separate art classes doing three different preps in three different rooms, on top of my regular art history and advanced art history sections being in different periods right now, and of course a humanities class that is separate altogether. Too many details. 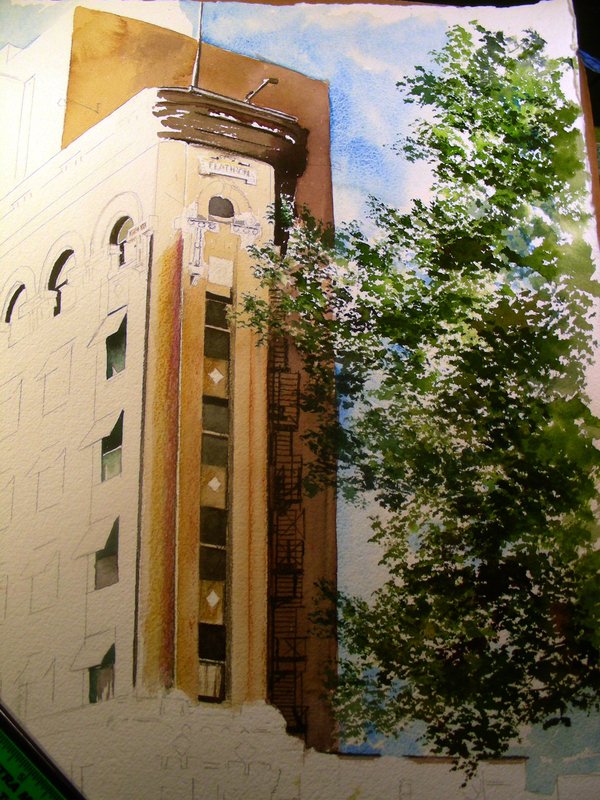 Somehow, I’ll find a way to continue chipping away at this large watercolor nevertheless. 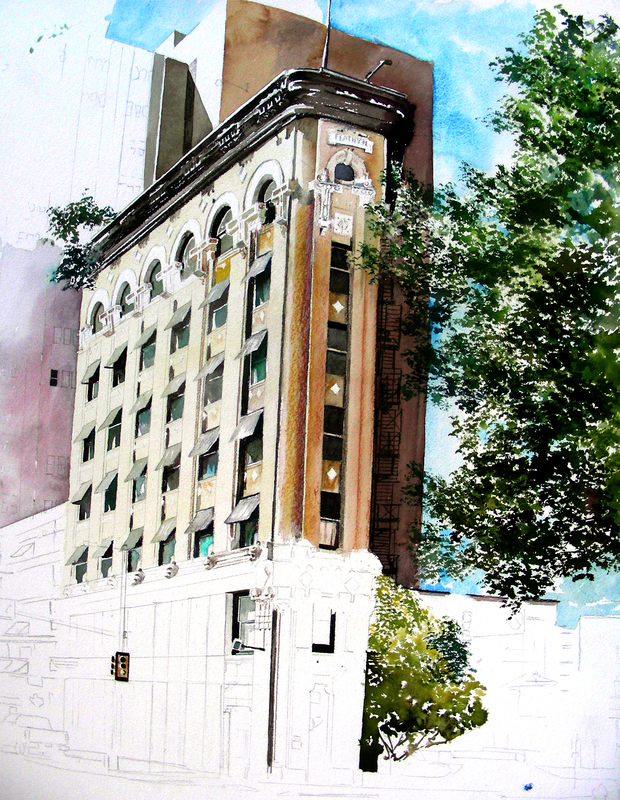 I had the privilege of painting a smaller composition of a flatiron in Eureka Springs, Arkansas–one lacking the historical depth of this particular one in Fort Worth. In both cases, I could not help rhapsodizing over how wonderful it would be to have one’s studio in one of these upper windows, looking over the city! I cannot help it–whether I’m painting a Victorian home, envying the one who resides inside the cupola, or painting an historic building, envying those who occupy prime window views overlooking the city, I’m always thinking of that perfect space to dream, to create. And now, it is this Fort Worth flatiron that holds my attention. My plan this evening is to get out the brush again and begin laying in more large color areas. I’ve enjoyed all the pencil work and detail, but I’m growing weary of seeing this composition from a distance and realizing it isn’t changing much over the days. It’s time to get it moving again. Over the weekend, I spent more time watching my private art student paint than engaging in my own work. I’ll post my own watercolor momentarily, but first wanted to show you this piece. 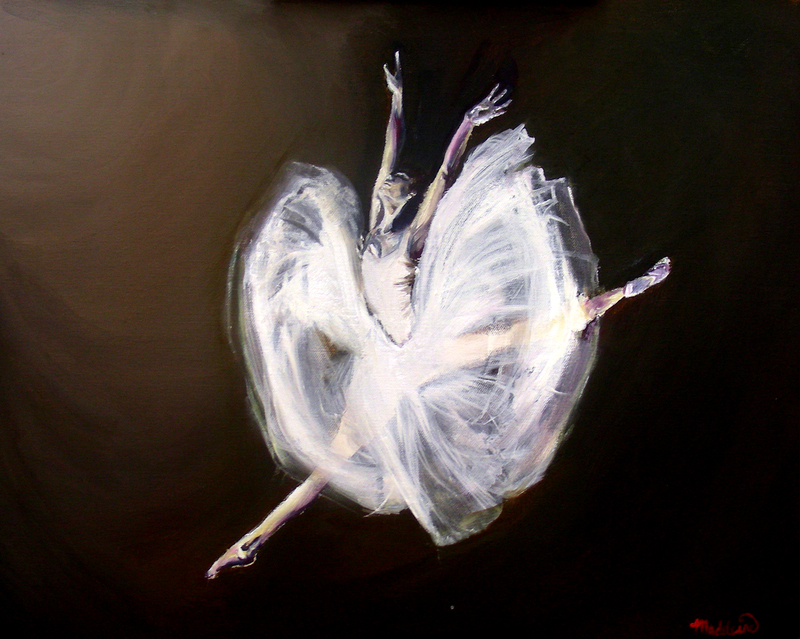 I am posting the results of the second day spent on this oil painting of a ballerina. My student spent the first day toning the background and blocking in the body without the tutu. Today, she continued rendering the shadows and highlights throughout the body, and then scumbled the first layers of the tutu. As I watched this painting emerge from the gloom, I could visualize Edgar Degas carving out a female form on toned paper, with a stick of pastel in hand. Indeed this young student seemed just as fast and deft with a brush as I imagined Degas in his studio. Watching this ballerina come forth from the gathering darkness was quite an enchanting experience for me, and I am sure my student felt the same level of thrill and accomplishment. What an amazing experience the artist knows, watching life emerge from the abyss, knowing that s/he is the one making it happen. Again, I must express amazement at this student’s level of concentration and focus on the work at hand. Viewing a projection of a black-and-white photo of this subject, this young artist chose a sepia background, mixing her own combination of green oxide, cadmium yellow deep, ultramarine blue and burnt umber, with traces of cadmium red medium. Turning to the figure, she chose to work lavenders into the shadows and yellows into the highlights, again using no “factory” flesh pigments, but blending her own flesh tones from a combination of primary and secondary colors. This canvas is approximately 14 x 16″ (not in my possession at the moment) and my student has put in about 3 hours on it so far. She will probably complete it at the next session. I cannot express my level of pride in her work. As stated in previous posts, she is currently in the ninth grade, seeking entrance into a magnet school for the visual arts in the fall. She is about two weeks away from submitting her portfolio of drawings and paintings. I have had the privilege of working with her only since last October, and am amazed to see what she has produced. She has so much to offer to the world of visual art, and possesses as much enthusiasm as ability to create. This historic Flatiron building, located at 9th & Houston on the southside of downtown Fort Worth, Texas, was erected between 1906-1907. The inspiration behind the building was the famous New York City flatiron. With my frequent walks around Fort Worth’s Sundance Square, I usually cannot resist a stroll to the south side so I can see this magnificent structure, particularly on sunny mornings when the east side of it is washed in the yellow sunlight. I have been at work on this piece for a couple of weeks, but sadly, I cannot seem to give it any more than an hour at a time, sometimes only five-to-ten minutes. There are simply too many distractions getting in the way. I can say that finally there is enough pigment on the paper that I can get “more interested” in the painting aspect, although there is still plenty of detail drawing to pursue, and I do find that time-consuming. Perhaps with the approaching weekend I can shut myself into the studio and see how far I can push it. The size is daunting (28 x 22″) and I must confess that I am frequently “lost” in the details of it, but I believe I’ll have a decent painting once it is completed. Meanwhile, I’m trying to find a little more joy in the process, and hopefully that will occur when I have more time to invest in it. In earlier posts, I have highlighted the work of a ninth-grade student whose parents have hired my services to assist her in preparing a portfolio for application to a magnet school for the arts. 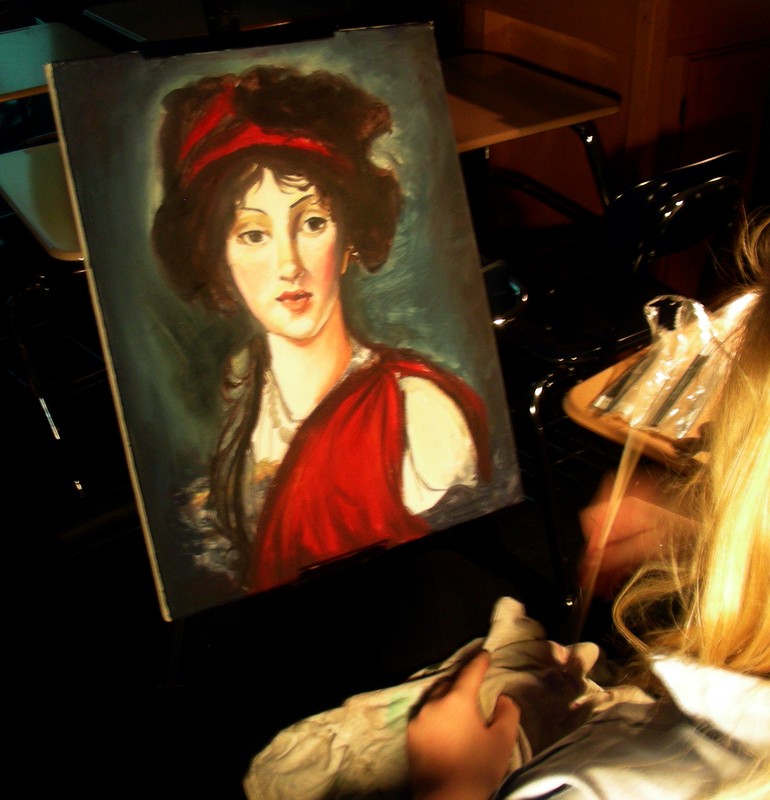 In my two-plus decades as an educator (over 90% of it teaching academic subjects), I have encountered less than five truly “exceptional” art students, geniuses. This is one of them, and she is in the ninth grade. I sincerely doubt that I will ever encounter another one so young with this level of skill and intelligence. Without trying to discuss the particulars of my pedagogy, I just want to point out that I really do not know how to teach skill to an art student. Like the Woody Allen sentiment, I find myself drawing extensively from art history to show students models of the kind of art they are pursuing, and hope it somehow rubs off. As I watch a student work, I often make corrections, sometimes demonstrating ways to improve on a particular technique. The picture posted here is of my student closing in on the finish of an oil portrait. 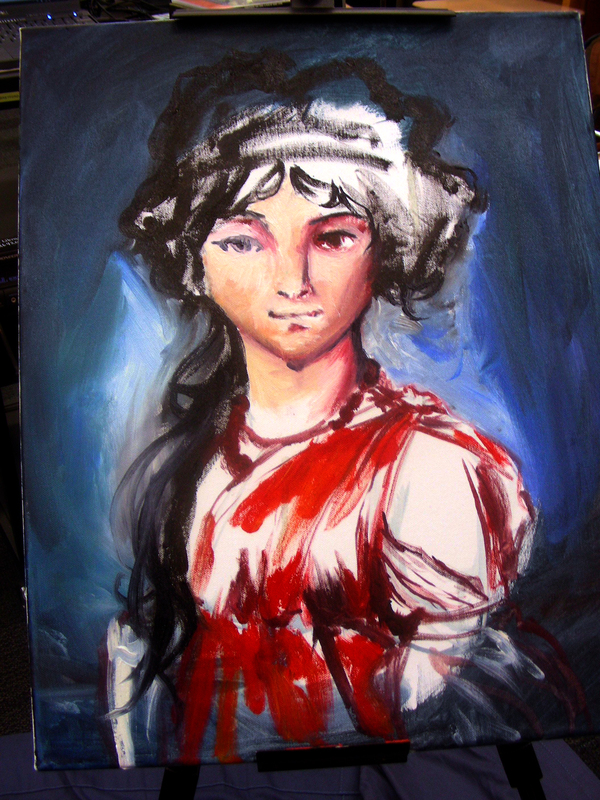 She chose a painting by Elisabeth Vigée Lebrun that we projected onto a giant screen in my darkened classroom. Then, with a broad brush loaded with turpentine-thinned paint, she blocked in the composition, using neither pencil or charcoal, and very rapidly built up this oil portrait, mixing most of her colors from pure pigments, avoiding neutrals on her palette. Burnt umber is her only neutral. She uses no black. She has no “flesh” or “light flesh” or “blush” colors–everything she mixes herself, with very little re-direction from me. There is a large part of me that is deeply satisfied knowing that I am putting a part of myself into the next generation of artists. At the same time, I remind myself that over 90% of this girl’s work is coming from herself–I feel that I am doing very, very little as I stand and observe her in action, every now and then offering a correction, a modification, an improvement (I hope!). But for the most part, I am watching a young genius develop, and it gives me boundless pleasure. Time constraints have made studio hours scarce lately. But I have the opportunity to enter the studio (man cave!) this afternoon, it appears. As you can see, I’m still hung up in the midst of this Fort Worth Flat Iron building located on the south side of downtown. My imagination has drifted recently to the Cathedral of Chartres (we are studying it now in Advanced Placement Art History) and the whole notion of sacred space. Having been brought up in a church background, and studying theology on a graduate level, I have been intrigued throughout my life with sacred space, and have found such within the confines of churches, libraries, outdoor settings, private studies, and even the driver’s seat of my Jeep. Whenever I find myself in a state of perfect balance and calm, whenever my internal and external world seems in order, I feel that I have entered a sacred space. Oftentimes, that sacred space is my garage, my man cave, my artist’s studio. Whether the VCR plays my documentary of the Cathedral of Chartres with its sacred geometry, or my stereo plays the Gregorian Chant, or even if I’m listening to recordings of T. S. Eliot reading his poetry, my dusty garage quickly transforms into a sanctuary, a sacred space, as long as I am working on a watercolor (I could probably get just as high by reading a book, but I do that in my study, not in the garage!). Creating watercolors in the garage works. The light is spectacular when I raise the door. I don’t have to worry about dripping water onto the concrete floor. I have much space for walking around, moving things about, and stepping way back from the painting to view it from a distance and from different angles. I have plenty of space to move the large watercolor papers from drafting table, to flat table, to easel, or even onto the floor. And I’m generally alone and solitary. When the cat comes out to visit, he isn’t intrusive; he generally requests only a blanket for a bed, and is content to keep to himself. If things go as planned, I’ll re-enter my sacred space after school today, and hopefully have a progress report to post this evening. Well, I never saw this coming. As anyone knows who speaks with me daily, or follows my blog, this has been the worst school year (schedule-wise) I’ve known in twenty-four years of teaching. And everyone knows I’ve spent far too much time griping about it. 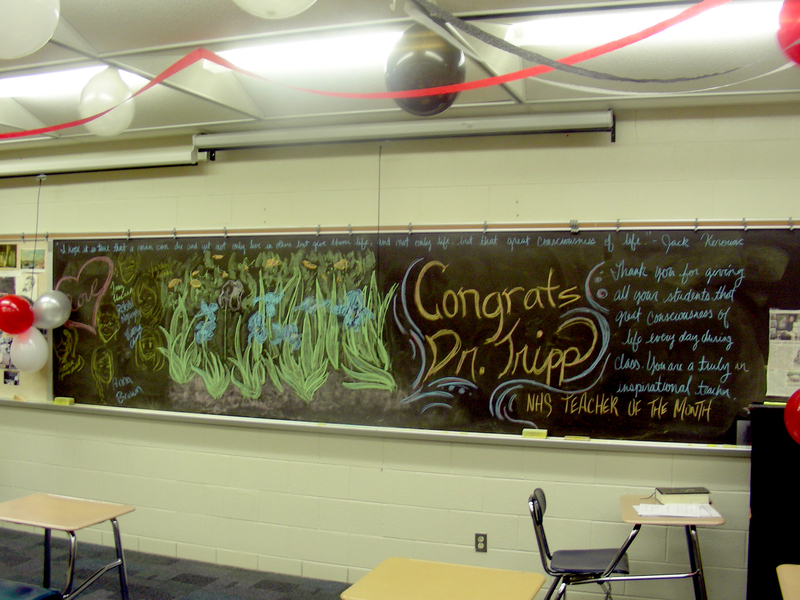 I entered my classroom one late afternoon about 5:00 and found it filled with balloons, congratulatory posters, and my blackboard covered with great images and sentiments. I had been chosen Teacher of the Month. I cannot describe how overwhelmed I was, and I guess it was good that I was alone. I could not control my emotions as I walked about the room, looking at all the decorations and reading all the inscriptions. I think what knocked me over was the realization that my students have gotten so little of me this year, because I’ve been spread so thin. And then they surprise me with this. Yes, I am overwhelmed, still. From now on, I would just like to be worthy of that. Thanks for reading. My painting buddy David Slight came over this evening, and we spent 3 hours in the “man cave” garage studio working on watercolors. It was a nice decompression after a hectic high school load earlier today (four 90-minute classes in 4 different classrooms, no conference period). Of course, there is the devil to pay. I still need to spend about 90 minutes finishing my regular art history prep for tomorrow. Fortunately I got the Advanced Placement Class finished before David came over. I’m hoping to get this painting finished in the next week or two. It is full-sized (22 x 28″), and the details are making me cross-eyed! I still have plenty of Flat Iron to tend, and then have a rich network of shadows to lay down on the pavement below. But, I’m finished for tonight. The hiatus from the studio is drying me out! School has been better lately, and I have found myself pouring more time and effort into classroom preparations (I’m teaching four different subjects this semester–ugh!) which has been good for school but bad for the studio. I’m trying my dead-level best to return to studio tonight (after prepping for two more subjects for tomorrow). The student whom I’ve been giving private lessons in the evening is ill right now, so I will not be teaching this evening. Perhaps I’ll pick up the brush. 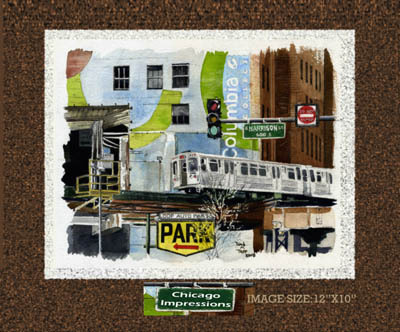 I’ve posted an original watercolor that I still have in my possession: Chicago Impressions. I photographed this composition while in Chicago a few years ago, visiting the Edward Hopper and Winslow Homer watercolor exhibits at the Art Institute. Though I’ve priced it at $250, and have it in a professionally prepared mat, it hasn’t managed to find a home. So, I continue to look at it. 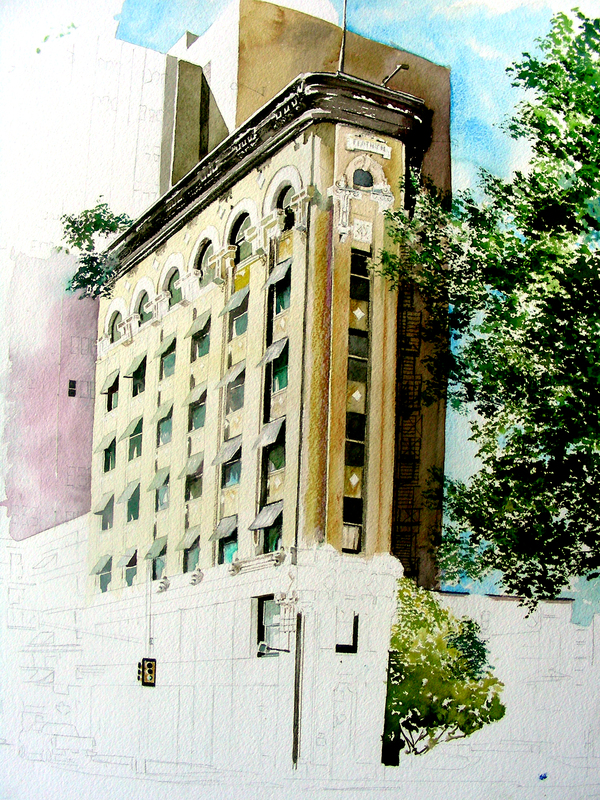 Tonight, I hope to return to the Fort Worth Flat Iron building I started last week, and have already posted repeatedly. 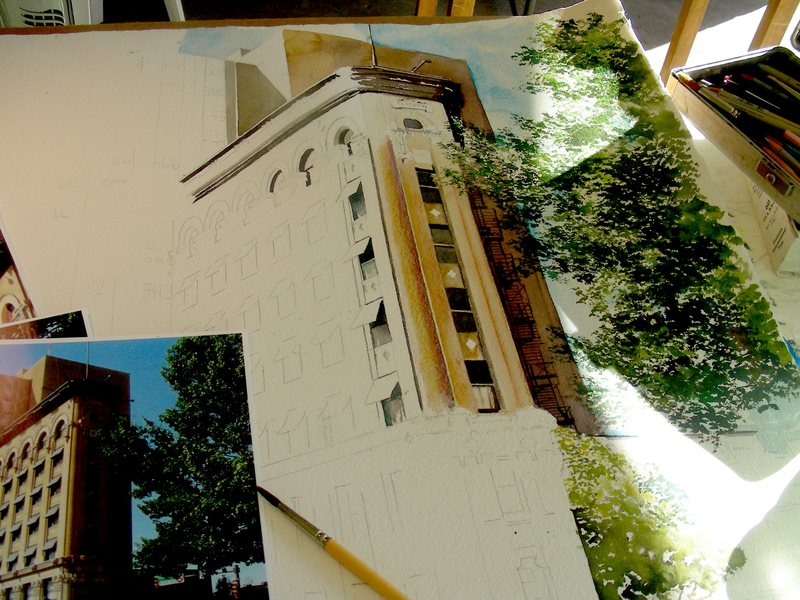 But my next plan is to create a large railroad composition, larger than any watercolor I’ve done to date. I have been restricted to the full-page layout of 22 x 28″ but now plan to cut a longer piece off a roll, and see where that takes me. I have painted quite a few train compositions, and often felt I was too hemmed in by the restricted size. The more I think on this, the more enthused I am about going after it. Thanks for reading. If you would like to check out my online store at cafe press (still a work in progress), you can log on to http://davidtripponline.com. In another post on this same day, I introduced my private art student, Maddie, who has studied with me since last October. Here, I have posted a one-hour oil sketch that she did as a preliminary to the finished portrait that I posted earlier. They are two separate paintings. I cannot express my pride in this young ladie’s work, seldom do I encounter students so young and so serious to learn their craft. Maddie never took a pencil or charcoal to this canvas; the portrait sketch was begun with turpentine-thinned oil for a sepia wash. She blocked it in quickly and accurately, then layered her paints following the preliminary sketch.